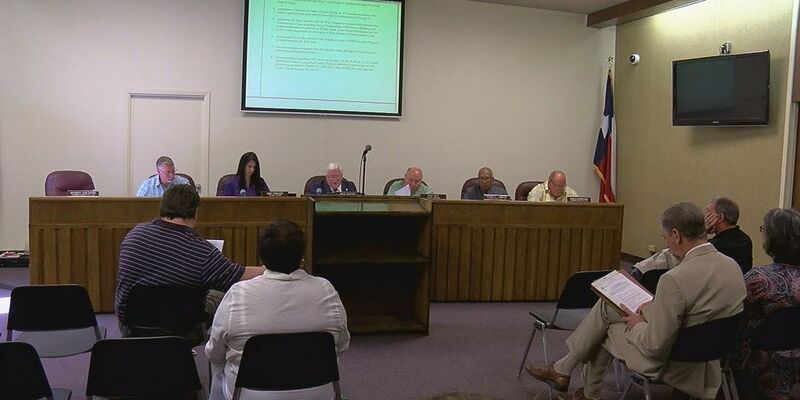 LUFKIN, TX (KTRE) - The 2018 budget for Angelina County employees is more than six months away. That has not stopped the county leaders from looking at various items that could save the county money as they start to work on a very tight budget. Today, county leaders voted to move employee insurance from AIG to Swiss Re. According to costs plans submitted, the move will save the county $61,959 in fixed costs. Due to slow economic growth, Judge Wes Suiter believes the budget will remain around the same $23 million spot it has for the past several years. County Auditor Eddie Gray said as the budget process begins at the end of the month, the money could be moved to other areas they are needed. "It isn't a lot of money but we are going in the right direction," Gray said. Suiter said any costs savings can help but the savings is small in the grand scheme of things. "We look at each department," Suiter said. "We look at each line item. We have 32 departments that by statute of the constitution, we have to fund every year and I can't pick or choose which ones I want to fund." Suiter said several years ago, county leaders looked at improving the health system for county employees. County employees are given a health screening at the county offices by professional medical personnel and according to Suiter several major health issues had been detected. Each claim is also audited so that it is made sure that no county or personnel money is being wasted. Suiter believes in the last five years the county has saved a combined $200,000 in fixed costs. According to the same figures the county has saved $173,874 over the past five years. Suiter and Gray believe major costs have also been saved in claim costs and liability costs. Because of the recent trend of savings on healthcare, Suiter pointed to how the county was able to give a 4% raise when the commissioners approved the 2017 budget. Gray also added that Angelina County is lucky when the costs of health insurance continues to rise. Another area the county is looking at savings for is in the energy sector. The county also approved the Way Companies to perform an energy audit, that could take about a month, on county buildings. The only buildings not included would be the county barns and the main courthouse. Gray said that the group will determine where energy is being saved or wasted and how the buildings could be upgraded to become more efficient. The county is not wanting to retrofit the main courthouse since there is a long term plan over the next several years to construct a new court house. Suiter said the current courthouse has patches to cover up some structural issues that are starting to show. Gray agreed with leaving the courthouse off the list. "It doesn't make a whole lot of since to go in and retro fit something you are going to replace in a short period of time," Gray said. Suiter is planning on getting the budget meetings started at the end of June and the county hopes to have an approved budget by September. "Fortunately we have been able to not cut services over the last 10-11 years where some counties have had to cut personnel or cut back on services We've been fortunate we have been able to maintain the same level of services with a little less money," Suiter said.